Cool Chromes is a semi-regular mini-feature looking at some slides that have recently passed through my scanner. In this edition of Cool Chromes we'll look at "cab units," the classic E-units and F-units built by the Electro-Motive Division of General Motors. Both types featured the streamlined "bulldog" nose. E-units had a pair of three-axle trucks and were built for passenger service; F-units had a pair of four-wheel trucks and saw service in both freight and passenger service. 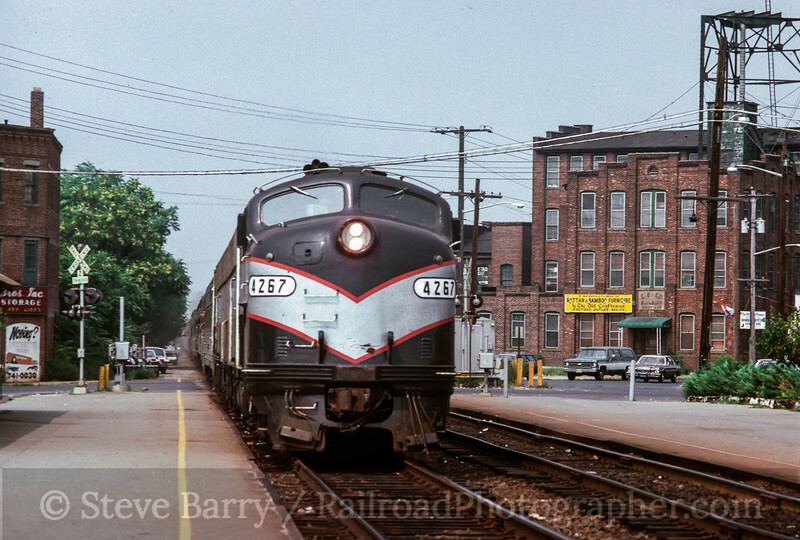 We start off with a pair of E8 locomotives leading Conrail's Office Car Special (OCS) past the Amtrak (ex-Pennsylvania Railroad) station in Harrisburg, Penn. 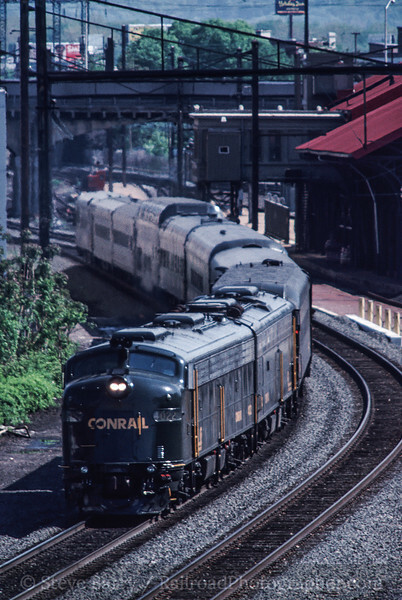 Conrail maintained three E8 units for business trains; when Conrail was split up between Norfolk Southern and CSX, the E8s were sold to businessman Bennett Levin of Philadelphia, where they have since been restored to their original Pennsylvania livery. Next we head to the Jersey Shore for an E8 leading a commuter train on New Jersey Transit at Red Bank on August 30, 1980. In the late 1970s into the early 1980s the former New York & Long Branch became a bastion for E-units. It was one of the last strongholds of six-axle cab unit power in regular passenger service. This shot was badly overexposed as shot; I've worked on it in Photoshop a little and still haven't got the colors as I remember them -- but then again, I could be remembering the colors as they were supposed to be, and not as they actually were. The E8s didn't get much maintenance (or paint) late in their careers. Let's stay in New Jersey for the next shot. Now we're on the Salem Branch of the former Pennsylvania-Reading Seashore Lines in Woodstown, N.J. (I don't have an exact date for this one, but it's probably 1996 or 1997). The line had been sold to Salem County and was (and still is) operated by the Southern Railroad of New Jersey. The SRNJ leased a pair of F3 units, one from the Tri-State Chapter of the National Railway Historical Society and one from the Anthracite Railroads Historical Society. The two units originally worked for the Bangor & Aroostook in Maine, but were purchased by the historical groups and restored into the tangerine-and-blue of the Central Railroad of New Jersey (Jersey Central Lines). 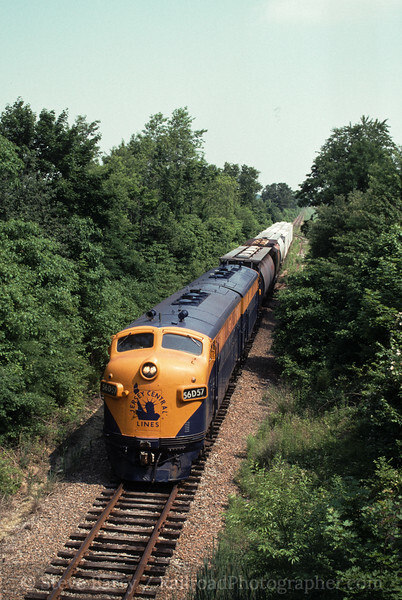 At the time the duo was one of the oldest sets of cab units in regular freight service in the U.S., but still drew little attention from photographers for some reason. In the years since this photo was taken, the two have since been relocated to Steamtown National Historic Site in Scranton, Penn., given a new paint scheme of the Delaware, Lackawanna & Western, and put into semi-regular service hauling passengers on the old Lackawanna main line. 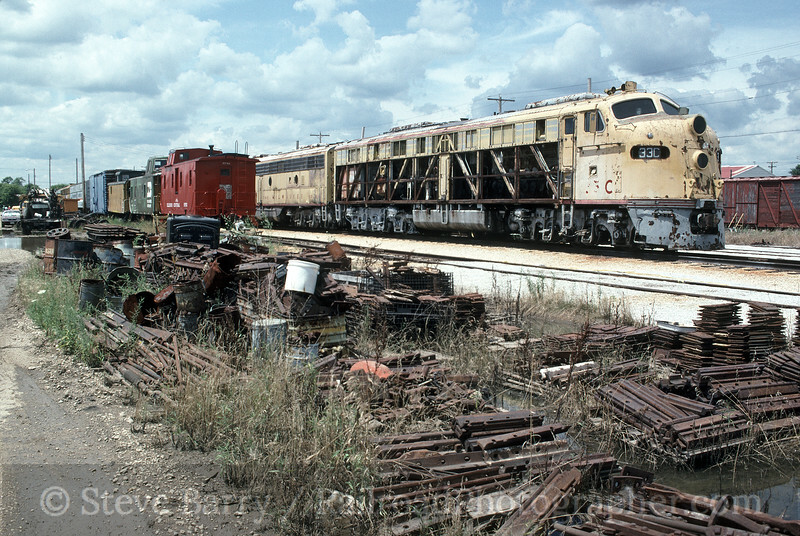 We conclude our cab unit tour at the Illinois Railway Museum in Union, where we find an ex-Milwaukee Road E8 sitting in the back lot on July 21, 1993. While this looks bad, IRM has one of the best track records of restoring, maintaining and otherwise taking care of its equipment of any private (i.e. non-government) railroad museum in the U.S. Despite its appearance, this E8 is in very good hands.